Hi: I have a mint condition DeTomaso Pantera for sale. It has a new 350 BOSS engine. Everything else is factory original. Lime green exterior with black interior. I could be wrong but if you list a car and someone requests info aren't you normally required to respond with some kind of answer.This is not a good way to start out as a newbie.Flame me if i'm wrong!! What is a 350 boss exactly? This car is currently on Ebay with one picture in what appears to be a northern climate. The fact that a one owner lime green car that has not been painted over is in itself a rarity. An ugly color but a nice looking car. The ad has a few more details. Some details, starting with the VIN would be nice. Hi everyone: I have never done anything like this so I would appreciate if you were not so mean. I am trying to sell a car that my husband owns. He had a stroke and can't write nor drive - so I have to do this for him. Check the VIN. It should only have letters/digits. Probably a typo. The VIN identifies when the car was built, which in turn tells a perspective buyer more about the car. Also, if you have any more pictures you could post that would be helpful. BTW, was the picture taken in Montana? Have ski'd there several times, truely "God's Country". Hi again: Thanks Whiplash - I always thought Doug liked the car at least as much as me. It has been his "baby" all these years! He never (in 25 years of marriage) has let me drive it! I'll try to get some additional pictures (the one I sent was taken over 20 years ago). Unfortunately it's raining and snowing. It is supposed to clear tomorrow. Lets hope so. The VIN number is correct -- that's what is printed on the little plate under the vindshield. The 0 before the 1 and 2 could be an Os (can't say for sure). The rest of the letters and numbers are correct. The picture is actually taken just south of Montana next to Jackson lake with the Teton's in the background in Wyoming (on our honeymoon). Thanks for the advice about letting people test drive it - makes a lot of sense. The last five characters of the VIN should be numbers. 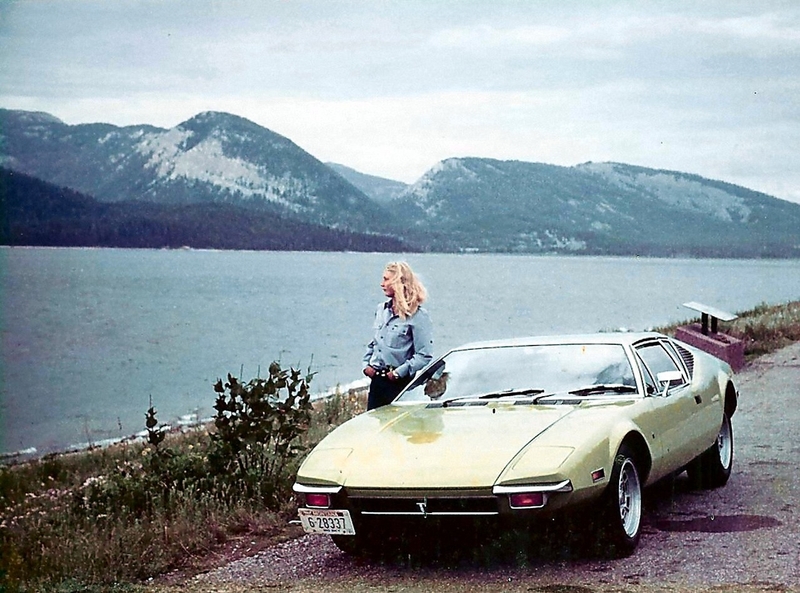 I just looked through the deTomaso Registry. Although this car is not listed, the LY in the VIN says that it was built in June of 1971. That would indicate that it is probably 01602 or 01702. I would guess that the 7 was not stamped clearly and looks like a /. You could look at the plate in the front trunk or it may be on your state registration slip or insurance card. I hope you are successful in finding it a good home. Thanks Jim! I think it is a 7 - the cross piece is hard to see. Also I took some more pictures of it (in the garage since the rain wouldn't let up) and can send those to anyone interested. I would like to know miles, price and location. Could you pls. mail some more pics as well? nice car; would you pls. mail me some more details + pics? could you please advise if your car is still for sale? I am located in Alberta.